Last week, Bloomberg explored why salt seems to be disappearing from restaurant tables. The article posited a variety of reasons for the absence of the once-prevalent tabletop sentry (alongside matching pepper shaker). First off, that old glass shaker with the rice grains in it has apparently been deemed too pedestrian to be served alongside an artisanal steak, say, crusted in pink Himalayan salt: “The No. 1 reason salt shakers are gone is the quality of the product they held: fine, iodized salt that costs about $1 a pound at supermarkets and delivers a harsh blast of saline that can blemish the food it’s supposed to accent.” Chefs spend a lot of time fine-tuning their food seasoning to get it absolutely perfect, and who are these salt-lickers to sprinkle an excess of sodium all over it? There’s also little room for the shakers themselves, as tables get more crowded, and dishes of kosher salt seem unsanitary, and also get swiped. But mainly, it’s the chefs steering the saltless charge, according to restaurant owner Gabriel Stulman: “If I had to guess why you don’t see salt more often, I would say chef ego: ‘My food is seasoned; you don’t need to season it.’” But what if you really, really like salt? 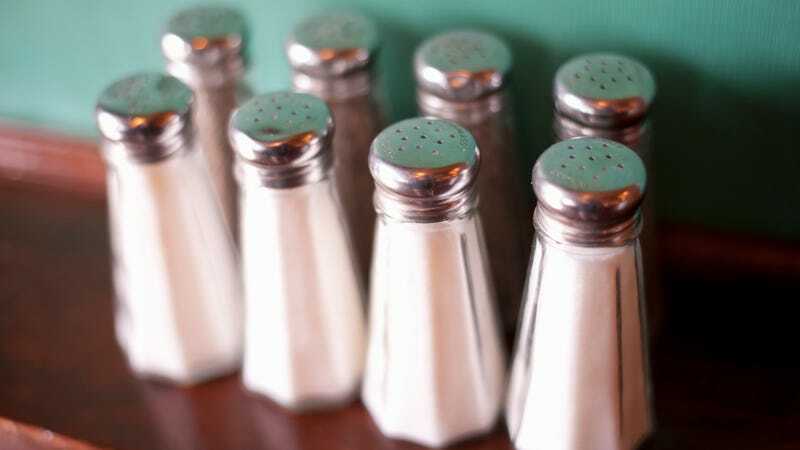 Unsurprisingly, this kicked off a salty (sorry) debate here at The Takeout: Should we be allowed to season our restaurant food anyway we wish (and if so, carry around our own salt shakers in our pockets)? Or abide by the chef’s wishes and trust that enough salt is already in our high-priced entree? If you’re eating at some multi-Michelin-starred, white tablecloth joint, then sure, I understand that the chef might want to maintain the utmost creative control over their dish’s final flavors. But at a casual restaurant—where customers are paying to have food taste the way they want—who cares if someone sprinkles a little extra salt on their plate? Should we also ban ketchup on burgers? Or not let customers remove the lettuce from their sandwich? Salt is just that little something extra that can turn the meal into something the customer loves. And when a dish is undersalted—a rarity, but it happens—do you really want to have to send it back to the kitchen when you could have a DIY solution less than a foot from your plate? One food I do like with extra salt and pepper is scrambled eggs, and if they arrive undersalted, I’m glad I have only to reach mere inches away to remedy the situation. I don’t care that it’s not hand-harvested gray limestone salt dredged from the depths of the Caspian Sea, or whatever. I’m just hungover and want my eggs to taste better. I get where these chefs are coming from. I feel like too many people just salt indiscriminately. This comes from eating with my in-laws; some of them salt their food without even tasting the dish first. Salt has not been a huge thing for me, so much so that for many years, I didn’t even have a salt-and-pepper shaker set. When I would host book club or a dinner party or something, this proved kind of embarassing when I would have to pull out the Morton box for my guests to season their food. I know this is non-gracious hostess-like of me, but I would kind of be internally pissed-off about it. It’s baked macaroni and cheese with gruyere! Do you know how much salt is in there already? Why not dump some ketchup on there while you’re at it? Same thing happens on weekends away with other families; there’s one friend I’m pretty sure just needs a straight-up salt lick. Then when the kids start pouring the salt on their dinners themselves… uuuhhh, I can feel my blood pressure rise in solidarity. I also think it’s one of those things that’s a self-fulfilling prophecy: The more salt you use, the less you’re actually tasting it, so then you just use more salt. It’s just a vicious circle until your blood vessels explode.